First things first...all sources are listed at the end. If you have any other questions, feel free to email me or leave it in the comments. When we first started planning and imagining what we wanted in this space, we knew we wanted it to be more sophisticated and didn't scream "baby boy". We didn't want a particular theme per say, but instead just wanted to add touches of two of our favorite things: traveling and animals. 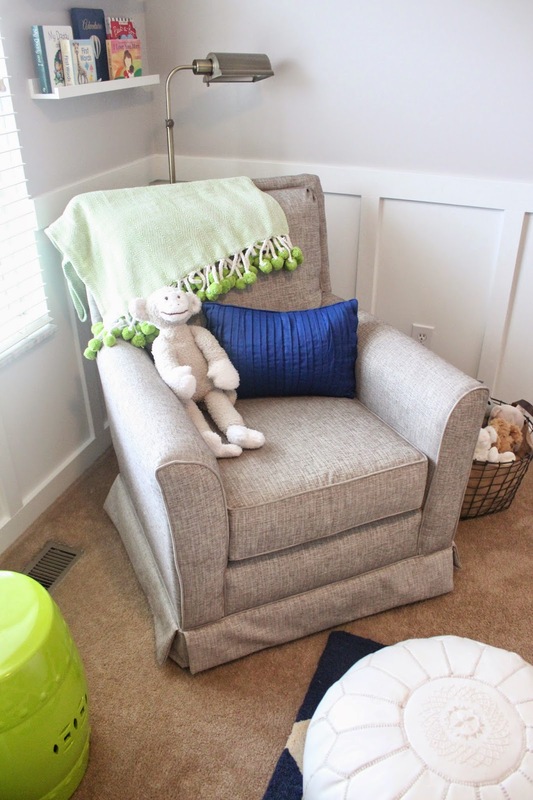 We also knew that we wanted to be able to reuse a lot of the decor or furniture in other areas in our home later on, so we stuck with white furniture (gender neutral for future babies) and went with a side table and ottoman that can be used in other rooms in our house down the road. *bumper is for decorative use, we know it should be removed when babe is in there. *for the "love travels" print-I added small heart stickers for the places Billy and I have traveled to together. I know it's cliche to say, but I literally sit in this room now and am so happy with how it turned out!! 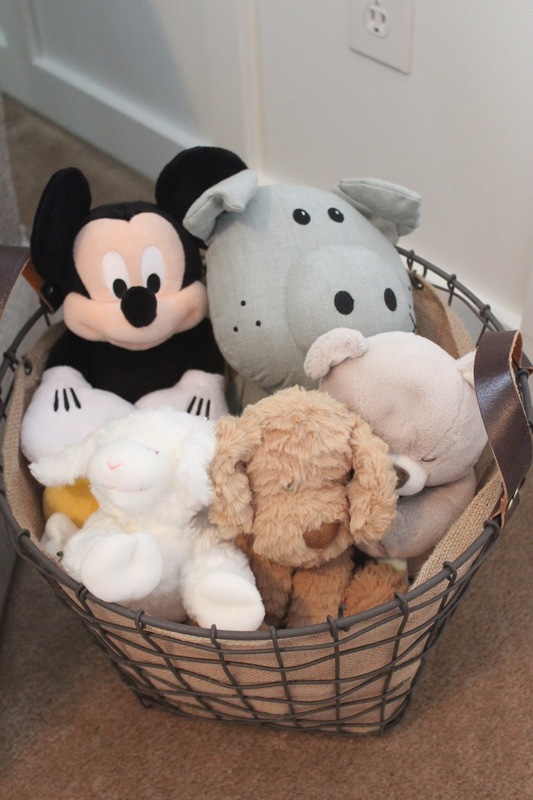 Since this is our first baby, I've obviously never decorated a room for a baby or had any experience even shopping for baby items, but I think we did a pretty damn good job for first timers. I had my doubts if I would like the color scheme (I LOVE now), if we would be able to fit everything in it (it's definitely not a large room, but we did it), and now I just smile and am so proud. Love, love, love! The first thing I thought was, "wow this will be so easy to morph into a baby girl nursery, if necessary!" which will definitely be a goal of mine one day. I love the personal, thoughtful touches! Great job, Katie & Billy! 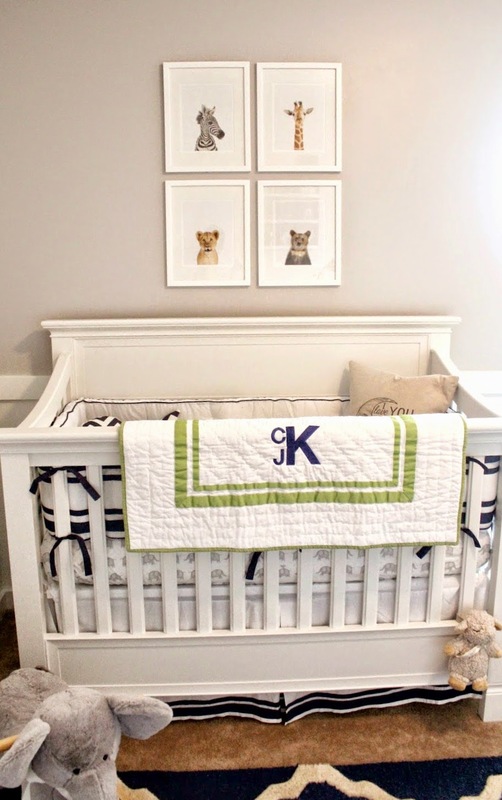 I love love love the nursery! The colors go together so well! And you could definitely use this again for baby #2? :) Love those animal prints so much! It looks absolutely amazing, Katie! Love it all! This is perfect!! I love baby rooms that don't scream "baby." We did the same thing, and now that Cameron is almost 2.5, his room still fits him! I cannot wait to see this little boy...he's so lucky to have you all as parents!! Love everything about it...you two did an amazing job!! What a great room. It's totally my style too because it's not "too" baby it "theme-y" but sweet and cozy. 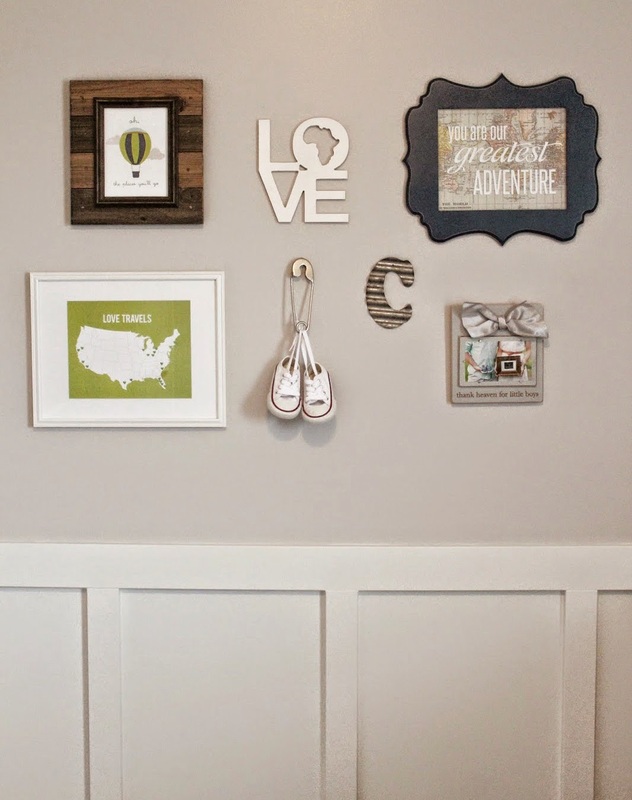 You guys did such a great job and the wainscoting is beyond beautiful! You did such a wonderful job - not one detail was missed!! Oh it's so nice! Well done! Love all the little touches like the "love you to the moon and back" pillow. And I LOVE the gallery wall! 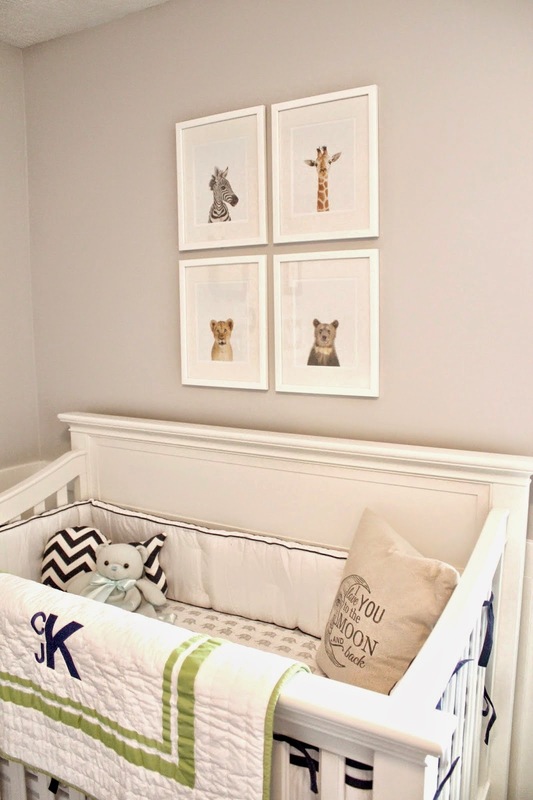 I just ordered the same animal prints for our nursery! What size are the ones you used? It's so cute! I just love the colors. Perfect room for a new baby. I love it! It is seriously perfect in every way, all it needs now is little guy in it! 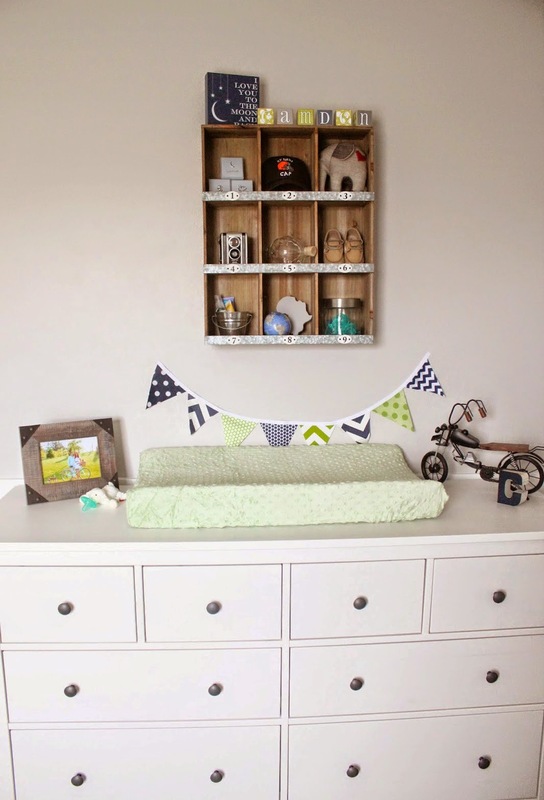 I love the boxed shelf above his changing station and the prints above his crib. I am going to go check out their site right now and look at their cute prints!!! Love the room! We have the exact same crib for our son (now 2) and still LOVE it!!! Looks so clean and modern! Love how it turned out! This room is gorgeous! You and Billy did a wonderful job! 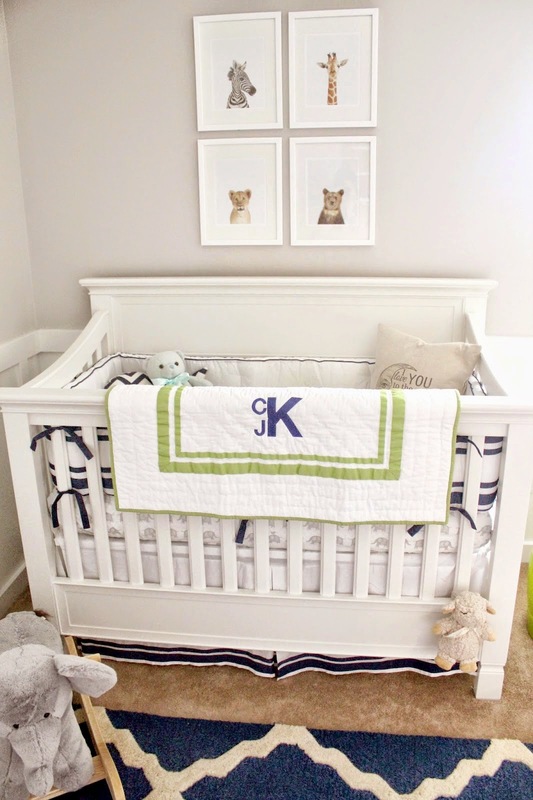 I absolutely love the color scheme and your choice to make it more "sophisticated" rather than traditional baby. 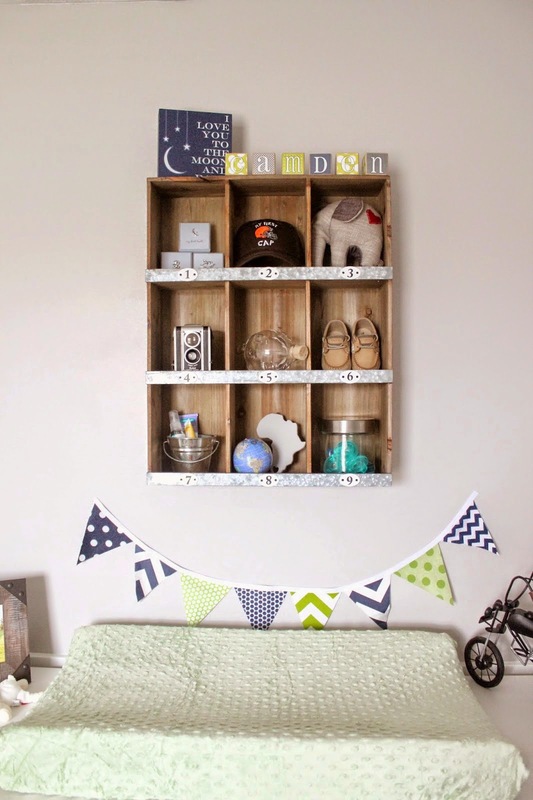 It's certainly an inspiration for my (very distant) future nursery! Absolutely LOVE it! Love the colors, love the shelf above the dresser, love it all! You guys did an awesome job! He is a lucky little boy. It turned out great Katie, I love it! Gorgeous!!!! 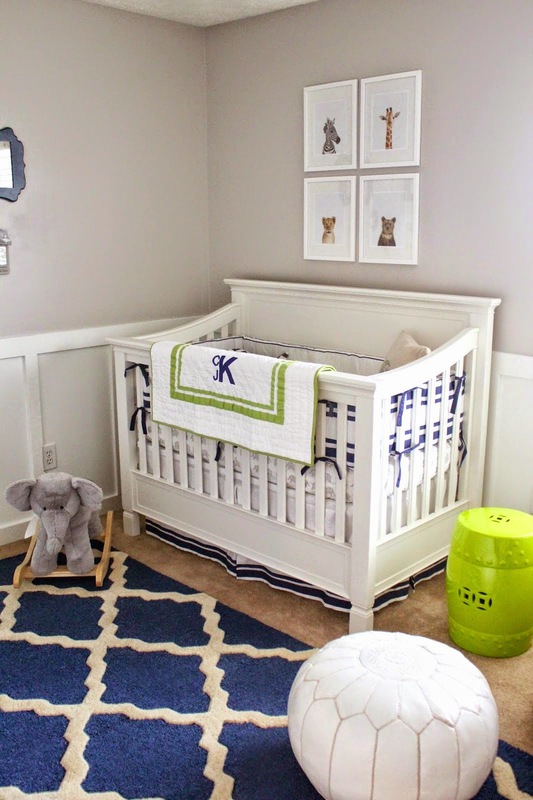 Love how you decorated it- it seriously looks perfect :) Now you just need that snuggly lil boy!! The room looks fantastic. I really like the sophistated look it has, yet it still is obviously a nursery. Did bumpers get the boot??? ( My youngest is 12 years old - and all three of my kids had bumpers in their crib so they wouldn't bonk their head.). I especially love your map idea! So clever. Maybe you can add different colored hearts for places that Camden travels to. Great job! that's such a good idea :) thanks for the tip girl! And yes, they are saying now bumpers are associated with SIDS but they do make mesh bumpers you can put in but they just aren't as cute! 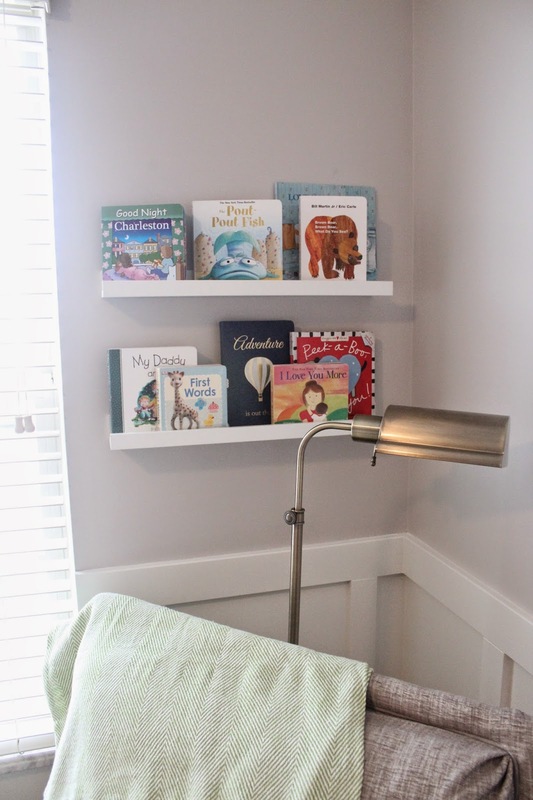 We just finished painting the nursery so it's great to see what uses other people have for some of the items we intend to purchase. The IKEA Hermes dresser is definitely an amazing addition I believe to any room, because it is so sturdy. Obsessed!! You did so well!! 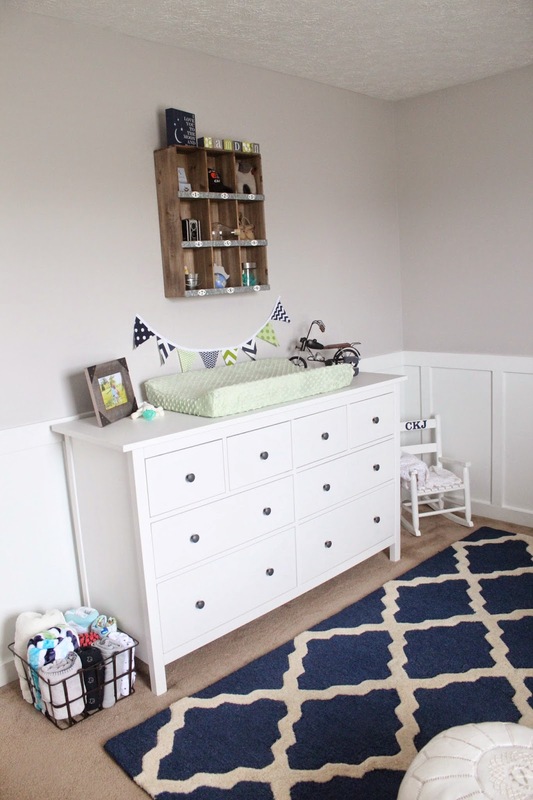 A magazine & Pinterest worthy nursery for sure. Camden is a lucky little guy. It turned out absolutely perfect Katie. He is one lucky little fellow. :) I know you had so much fun getting it ready for him. YAY for his birth day getting closer and closer! This looks amazing Katie! 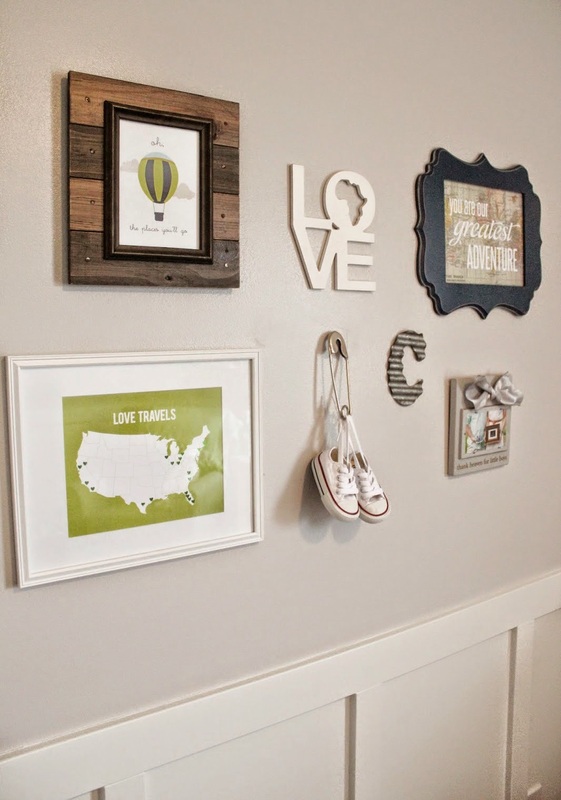 I love the gallery wall and the Love Travels picture. So creative and like you said you can use a lot of this in other places as Camden gets older. Katie, you & Billy did an amazing job!! I love it all!! 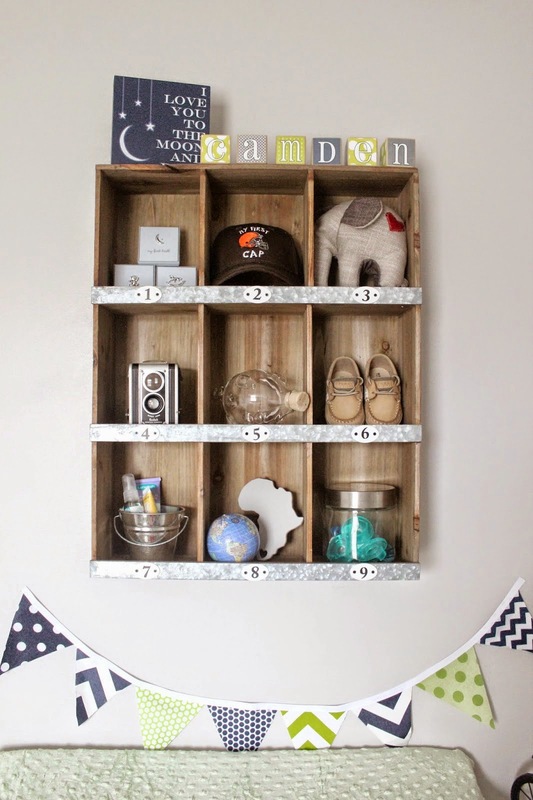 Camden will love it as well & it's certainly a room that will grow with him! Great job! It is too cute. I just ADORE it!!!! 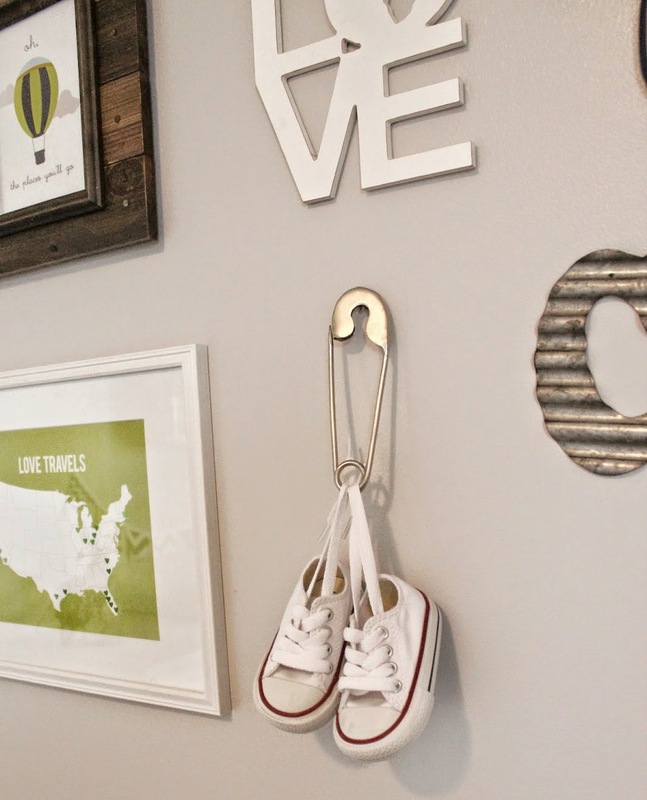 I think my absolute favorite part are the sneakers hanging on the wall. So creative & just the perfect touch!! C'mon Baby C! !